New York, February 20, 2018 – Fast Company today announced its annual ranking of the world’s Most Innovative Companies (MIC) for 2018, honoring leading enterprises and rising newcomers that exemplify the best in business and innovation. Global digital agency, Isobar, was ranked as one of the Top 10 Most Innovative Companies in Augmented Reality and Virtual Reality. 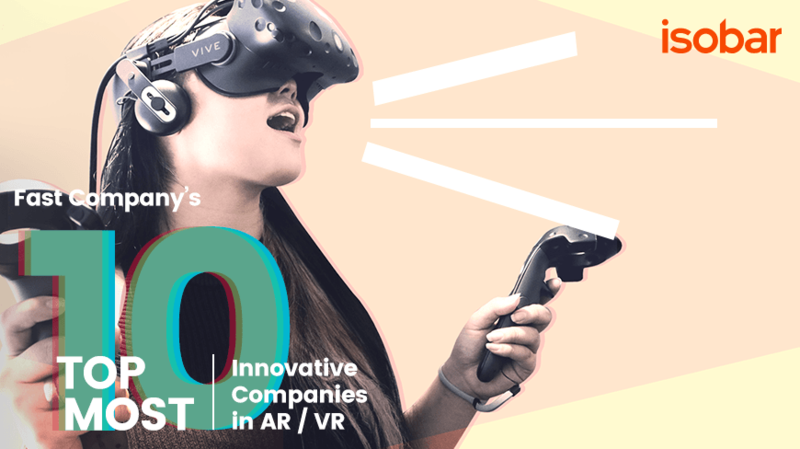 The other nine companies included in the AR/VR list include Lowe’s, Houzz, Wayfair, Unity Technologies, Blippar, Best Western, Baobab Studios, Felix & Paul Studios, and Artefact. Each year, Fast Company publishes its Top 10 lists, which recognize pioneering companies across 36 categories, from artificial intelligence to wellness. More than three dozen Fast Company editors, reporters, and contributors surveyed thousands of companies to create these lists. Most Innovative Companies is Fast Company’s signature franchise and one of its most highly anticipated editorial efforts of the year. It provides both a snapshot and a road map for the future of innovation across the most dynamic sectors of the economy. “This year’s MIC list is an inspiring and insightful window into how many companies have embraced innovation and are working to make meaningful change,” said Fast Company deputy editor David Lidsky, who oversaw the issue with senior editor Amy Farley. Fast Company’s Most Innovative Companies issue (March-April 2018) is now available online at www.fastcompany.com/MIC, as well as in app form via iTunes and on newsstands beginning February 27.